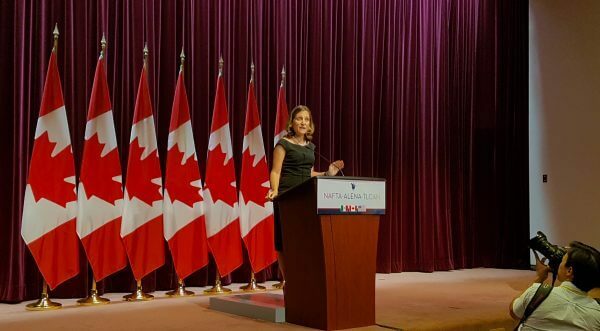 Foreign Affairs Minister Chrystia Freeland speaking to media at the end of the third round of NAFTA talks in Ottawa. Originally published October 1, 2018, on realagriculture. So far, market access into the Canadian dairy sector has been pegged at around 3.59 per cent to even 3.9 per cent, according to Graham Lloyd with the Dairy Farmers of Ontario (DFO). To some, that might seem like a small number but in reality it’s a big chunk of change, as the annual Canadian dairy market is around US$16 Billion. So how much will the red and white have to accept from the U.S.? 50,000 metric tonnes of fluid milk, 12,500 metric tonnes of cheese, 10,500 metric tonnes of cream, and 4,000 metric tonnes of butter, according to a statement by the USTR. This is one item that will roll out quicker than other provisions. It’s expected to go into effect six months after the USMCA deal is in place. What is it? Class 6 is milk used to process skim milk components or condensed skim milk components, wet or dry, into an ingredient to be used in processed milk products. For example, skim milk powder, milk protein concentrate, or ultra-filtered milk. Class 7 is comprised of skim milk components, including milk protein concentrates, skim milk and whole milk powders, edible casein, rennet casein, and various powders derived from milk products. The new provision will eliminate the pricing structure set by the Canadian Dairy Industry. It was originally put in place by Ontario, but then it was seen as a move the entire dairy industry should take, so it was put in place on a national level around March of last year. Freeland went on to say that, in all, the new trade agreement preserves and maintains the Canadian supply management system. When asked if there was going to be compensation for other agriculture industries affected by the new agreement, Freeland reiterated there will be compensation for dairy farmers — not once mentioning any other sectors. You’ll be seeing a lot more chicken and eggs from the U.S. USTR numbers show the amount of chicken exported from America will be 57,000 MT by the sixth year, with a one per cent increase each additional year, for 10 years. With regards to eggs, the red and white will see an intake of 10 million dozen eggs in the first year of the USMCA. There after, just like chicken, the export number will gain one per cent, every year after, for 10 years. The USMCA includes a part where it states, U.S. grown wheat delivered to Canada will be treated the same as Canadian-grown wheat within the current grading system in place. There’s also a new requirement that will force the three countries to reduce their subsidies and ag safeguards for products traded between the three countries. According to SaskWheat, the pact also addresses agricultural biotechnology, including plant breeding, and requires the three countries to enhance their cooperation and exchange of information on biotechnology matters related to trade.